I want to create a significant archive of representative print samples. I want to document how artists create them, what materials and processes are common, what the image quality is like, and how these finished prints age over time. Let’s call this research objective the “Aardenburg Digital Print Research Program.” It is a tall order, one that would not be possible without personal computers and the internet, and one that will ultimately require thousands of samples to be anything more than merely a “proof of concept” exercise. Where does one start? – with my first participant and a lot of youthful enthusiasm… a bit tough for an aging baby boomer, but I’m not going to be discouraged by obvious limitations! Huge numbers of samples are ultimately needed in order to be truly representative of this modern era of digital photography. Our modern photographic era is anything but simple. The choices we have today for making images, printing images, storing images, and distributing images are vastly more bountiful than what existed fifteen or twenty years ago. I want to look carefully at one specific aspect of this complex digital photographic world, namely, the digitally mastered prints. I was initially thinking very conventionally about how Aardenburg could contribute to the body of published research results available on the image quality and image permanence of modern digital prints. I thought about equipping my lab with the typical instrumentation and performing the conventional accelerated aging tests. No doubt I will do more laboratory testing in time because I have been personally involved in this type of research for many years and am pretty good at it. However, I realized that the endusers of this technology (photographers, artists, printmakers, etc.) don’t necessarily choose technologies I choose, print the way I print, or finish their prints the way I finish them. Nor could I possibly acquire all of the diverse printers, inks, and papers necessary to gain a suitably representative sample population of modern digital print technologies. Moreover, although laboratory studies can provide some “apples-to-apples” comparative test results in an expedient way, extrapolating those results to real world conditions is problematic at best. The real world is simply too environmentally diverse for scientists to successfully define one common environmental standard that reasonably reduces the test results to a simple summary which applies to all consumers equally. A sorely needed piece of this puzzle is a very comprehensive real world testing and monitoring program that reaches beyond the walls of museums and archives. Museums and archives have a rich tradition of research projects that attempt to environmentally document and monitor changes taking place over time for art on display in their protected museum environments or in transit for art on loan to other institutions. The Museums and Archives community has therefore paved the way for real world environmental studies, except that the typical museum environment is not the consumer’s or individual collector’s environment. Thus, the idea for the Aardenburg Digital Print Research program is to extend and enhance museum monitoring protocols for research in the consumer home and office environment. To date, I have briefly mentioned how I plan to gather temperature, humidity, and light intensity data. The devil is always in the details, but hopefully, you now have some idea as to how that aspect of my real world research program is going to work. Yet I haven’t indicated what measurements will be collected from the digital prints or how I will implement this component of my research. Well, it will involve spectral measurements of specific colors and tones that get printed directly by the artist/printmaker while the actual prints are being made. First, there will be a “standard set” of colors which is common to every printed sample irrespective of what colors actually exist in the artist’s image. Many photographers will instantly recognize the majority of the colors in Aardenburg’s standard color set because they are the basis for a “de facto” color reproduction standard widely used in the photographic industry today. Aardenburg’s standard set contains all 24 colorimetrically defined values of the GretagMacbeth ColorChecker® chart. These 24 colors are digitally mastered and printed within the color gamut and rendering parameters of each printing system. 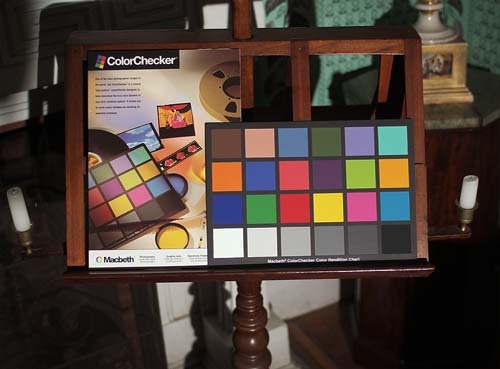 The GretagMacbeth ColorChecker® Chart, originally developed by C. S. McCamy, H. Marcus and J. G. Davidson in 1976 as a color reproduction test for photography, television and printing, is used widely today for digital photography color accuracy tests and color profiling. Thus, it has an over 30 year track record in the photographic industry for color and tone reproduction evaluation. 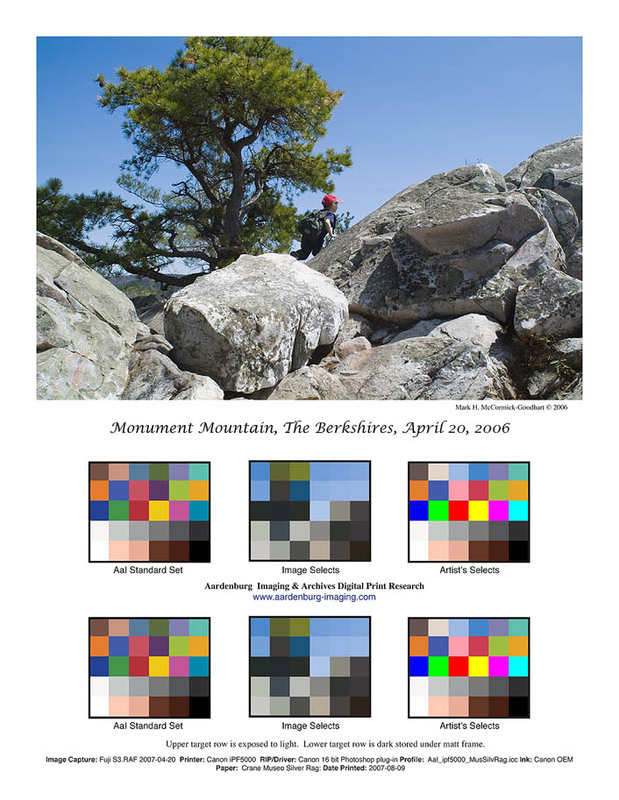 Although its colors do not challenge the full color range of most modern imaging and printing systems, several colors in the chart spectrally mimic known human memory colors (e.g., light skin tones, dark skin tones, blue sky, green foliage, etc). With respect to image permanence testing, the 24 target colors have enough chroma and hue variety to exercise the necessary colorant mixing and blends that need to be assessed for chemical aging interactions. The 24 colors of the ColorChecker chart are supplemented by 6 more colors for a total AaI standard set of 30 color patches. Lacking in the Macbeth ColorChecker® target are patches to ensure that paper “white” and maximum paper “black” get printed and measured. This problem is not a flaw in the ColorChecker® chart. The patches are lacking because it is impossible to construct a physical color chart that automatically guarantees paper white and paper black values will appear in a printed reproduction of the chart. The AaI standard set will ensure paper “white” and paper “black” gets printed and measured by assigning the digital values necessary to define paper white and paper black in the printing process. The remaining four colors in the AaI standard set are more skin tone colors to supplement the two skin tone colors already present in the ColorChecker® target. Next, 30 image-specific colors are extracted from the digital data in the artist’s chosen image. I refer to this set of colors as the “Image Selects” set. These image-specific colors will be derived using an ordered spatial sampling method for use with the I* color and tonal accuracy metric (see AaI’s documents page for more information about the I* metric). Because they are extracted from the final prepared digital file used to print the artist’s work, the Image Selects color patches are an exact physical match to specific color areas within the printed image. They not only capture the color and tone relationships but also the precise screening and colorant mixing patterns which are unique to the chosen printer, printer driver/RIP, ink, paper, and finishing treatments used in the making of the actual artwork. Another set of 30 colors are reserved for the artists’ and printmaker’s choice of colors. I refer to this set of colors as “Artist’s Selects.” If the Artist and printmaker do not choose any custom colors, then the Artist’s Selects color array will by default be identical to the AaI standard color set and therefore serve as a full replicate of the standard set of color patches in test. As more of those colors are customized by the artist and/or printmaker, any undeclared colors in this group will stay filled by standard set colors as partial replicates of the total AaI standard set. Artists and printmakers can choose to augment the colors sampled by the Image Selects set or they can choose from their entire digital color palette that the printing process is capable of rendering. For example, the printmaker might want to see how certain colors at the limits of his color gamut withstand fading over time even though those specific colors are not represented in the artist’s work being reproduced at the time. Finally, the three color sets are reproduced at two locations on the printed sheet. One row of all 90 target colors is hidden under the picture frame matt board as a thermal aging control group while a second row of 90 colors is on display in the matt window area along with the pictorial image. The exact configuration of these rows may vary depending on actual print size and perhaps also due to the choice of spectrophotometer used to measure the color patches, but in all cases there will be a 90 patch color group available for light exposure, and another 90 patch color group protected from light exposure by the picture frame matting materials. An important technical point in this research is that the measured data will be spectral rather than colorimetric or densitometric data. Although Aardenburg Imaging intends to use the I* metric for much of its research, researchers using the Aardenburg Archives database will be able to apply conventional color difference equations and even different color models (CIELAB, CIECAM02, etc) to the acquired data sets. Shown below is an illustration of a digital file prepared for lettersize desktop printing. The colors are shown here in an sRGB working space, but will be rendered to print through the specific printer driver and profiling choices made by the printmaker. A digital file prepared with added color target data in a format printable on a desktop printer using letter-size paper. Larger prints produced on large format printers will have ample room to locate the Aardenburg color target data that will be required for the real world digital print research. For a full PDF version of this illustration click here. The pilot project is simply a small-scale version of the larger envisioned digital print research project. The pilot study is necessary in order to work on the infrastructure that will be needed to deploy, track, and analyze a much larger population of print samples. I’ve been trying to figure out a more suitable term to describe the participants in the study. Participants are in some ways clients, in some ways sponsors, and in a very real way my research assistants helping Aardenburg Imaging to acquire the environmental data and place the samples into real world environments. I hope that the pilot study will be an exciting experience for all of us, and lead smoothly into the full scale digital print research program!